Bute Inlet has some of the most dramatic mountain scenery on the BC coast. Dr. Rod Nugent, on board a recent Mothership Adventures cruise, likened the fjord to the Grand Canyon. 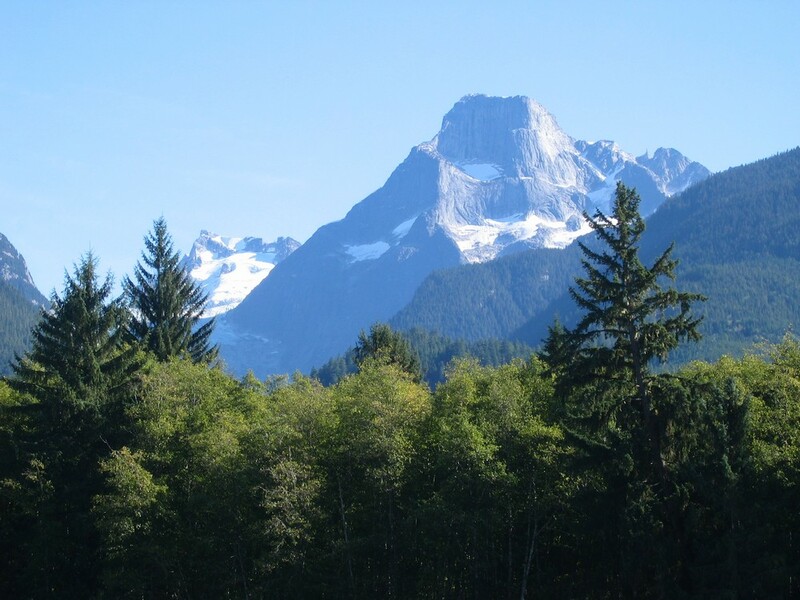 The highest mountain in BC, Mount Waddington, towers like an up-thrust finger above the Homathko River Valley on a clear day. It’s surrounded by many other grand peaks. 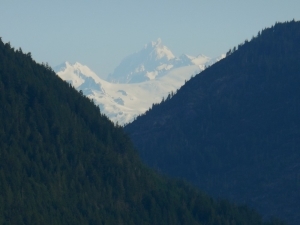 A glimpsed view of Mount Waddington, as seen from the head of Bute Inlet. It’s the tallest mountain in BC is and it’s named for an entrepreneur who grossly exaggerated his claims that Bute Inlet was an easy route into the interior. Some people believe the name of this mountain should be changed to Klatsassin, rather than honouring a man who sparked a war and many deaths. Here’s the story. The idea for building a wagon road through the Homathko River Valley, at the head of Bute Inlet, came to Alfred Waddington in the winter of 1861. Running his finger along a map of BC, he speculated this deep inlet might be the shortest and easiest route into the Cariboo Gold Rush. A toll road on the Homathko River would bring he and his partners profit and ensure outfitting business remained in Victoria, where he had a store. As it was, miners were beginning to shift to the upstart town of New Westminster, at the start of the arduous Fraser River trail. Waddington sent surveyors to Bute, who returned with tales of hardship—but he wasn’t interested in the extreme difficulties they encountered. They confirmed the Aboriginal people had a trail through the mountains, and that’s all he wanted to hear. When Waddington finally visited himself, he went just far enough upriver to see the wide estuary, before he dashed back to Victoria to trumpet the glories of his new route. Mount Bute, seen from the Homathko River estuary. To rally funders behind his wagon road project, Alfred Waddington announced in the Colonist Newspaper that Bute Inlet was the ideal route in every way. “The country is not mountainous andthere are frequent openings with fine tracts of land,” he wrote. With backers in place, Waddington sent a road building crew to start construction before survey work was complete and the though the crew had to cut, blast and bridge through steep canyons at great cost, he remained undaunted. Worst still, the crew returned the next year to find much of their worked had been destroyed by spring freshets and slides. And by the third season, with finances dwindling and the crew on slim rations–and no food for the Aboriginal crew–trouble erupted. When some flour went missing , the Tsilhqot’ins were blamed and one of Waddington’s partners told the Aboriginal people they’d be infected with smallpox if they didn’t return it. This was a final blow for the Tsilhoquot’in. A smallpox epidemic was raging at the time and had already taken thousands of Aboriginal people’s lives. They declared war on the colony, starting with the wagon road crew, who were killed in an early morning raid. The warriors, under the leadership of a chief named Klatsassin, continued up the trail into the interior of the province. 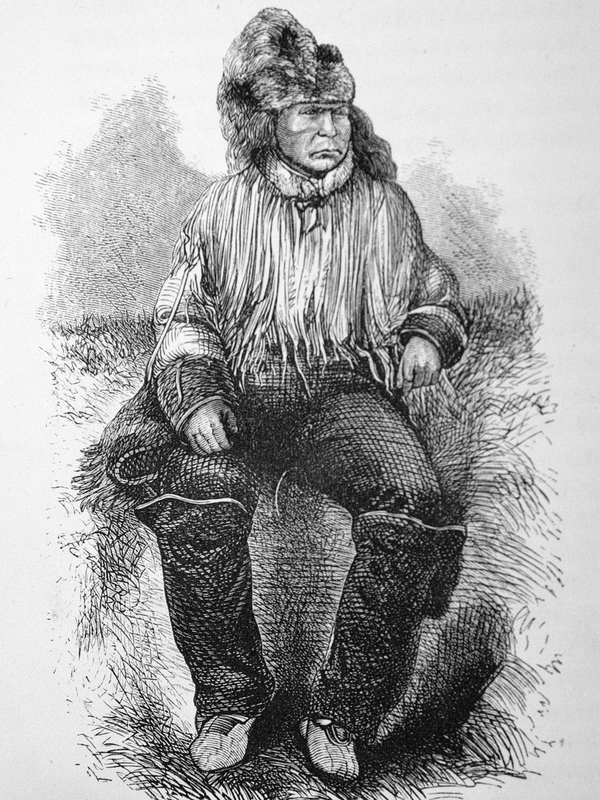 A sketch of Chief Klatsassin from his biography. Posses were sent in both directions, one up the Fraser and another up the Homathko River, but the warriors, though far outnumbered, easily eluded them. When posses destroyed Tsilhoquot’in winter villages and food caches, however, the warriors were trapped. Their people were starving so they agreed to what they understood were peace talks. Instead they were clapped in irons and tried as murderers. Five men were convicted and hung, though the worst one young man had done was shoot a horse out from beneath a rancher. He kept his eyes fixed upon me. He has a striking face; the great underjaw betokened strong power of will; the yes, which were not black, like most Indians, but of a very dark blue, and full of a strange, it might be a dangerous, light, were keen and searching. He never took them off the speaker, but seemed to be perusing with them my inmost soul, as if he meant to ascertain not only whether I spoke true, but whether I believed in my heart what I said. His physical strength, his power of will, his courage, his unscrupulousness, had won him this pre-eminence. When he spoke one could scarcely believe that this was a man charged with murder. One could hardly look at Klatsassin without feeling that there was about the man at once something awful, and something winning—in fact something threat. The Chiclotin War, as it’s now referred to, ended Waddington’s ill-conceived plan for a wagon road but it didn’t stop his scheming for ways to profit from his lease holdings there. About a decade later, when he was in Ottawa promoting Bute Inlet as a transcontinental railway terminus, he shook hands with a doctor infected with smallpox and died. In 1993 a Cariboo-Chilcotin Justice Inquiry found that Klatsassin and the others had been unfairly tried and sentenced and the Province of BC made a formal apology. A monument was erected on the warrior’s grave site, marked by an annual Klatsassin Memorial Day. This apology was recently affirmed by the current Liberal government. The next step logical step is to change the name of Mount Waddington to Mount Klatsassin. For more on this story see Judith William’s book High Slack; and the U’Vic website: http://www.canadianmysteries.ca/sites/klatsassin/home/indexen.html. Thanks for this opportunity to tune in on the discussion regarding the name change idea for Mt. Waddington. After recently reading the Rob Vipond review on historian Tom Swanky’s Book “The True Story of Canada’s War of Extermination On the Pacific” your proposal is timely…in fact imperative if we are to take seriously Swanky’s research. Supporting a name change could be considered a small act of attrition for the brutal treatment of coastal tribes by colonial leaders. In order to assure broad support and to use the name change issue as an educational opportunity I was wondering if the Sliammon people may want to be involved in the discussion. I have now read the blog. Very cool. I had read some of that history before but had lost it in the recesses of my old brain. Yes, the mountain should be renamed! We have a very interesting way of leaving really important people out of history. Most of the time it’s because they were not part of the power elite. Franklin was a “Dork” but look at the press & historic position he is placed? Hi Jeanette. Thanks for the mention of High Slack in the Scribes piece. My feelings about renaming the mountain are mixed. I agree Mystery Mountain should lose the name Mt. Waddington. However, there is a Mt. Klattsassine up the Homathko Valley. The other point is that Klattsassine is translated by the Chilcotin as “Nobody knows his name”. I have an old map that shows an area on the upper Southgate side labelled “Klattsassin’s Hunting Grounds”. I always loved the name Mystery Mountain and would choose that OR the Homathko name which I think is also appropriate. According to Randy Bouchard and Dorothy Kennedy there are two spellings: Xwe7xw or Xwe7xwkw. They give no meaning but they are currently working with the Homalco and may have more info. I was told that the word for wind was also the word for the mountain in Homalco dialect. I do cover some of this in the upcoming Schnarr’s Landing [book] as I am including a lot of Homalco site names. Randy Bouchard has been as helpful as usual.